A renal biopsy is a procedure used to obtain a segment of renal tissue, usually through a needle or another surgical instrument. Analysis of this tissue is then used in the diagnosis of an underlying renal condition. In native kidneys, renal biopsy is used to identify various renal diseases especially glomerular or interstitial pathologies. It can also aid in the diagnosis of renal masses and malignancies, the most common being renal cell carcinoma. On a transplanted kidney, renal biopsy is indicated anytime when graft dysfunction ensues with a raise in serum creatinine. Renal biopsy aids in diagnosing graft rejection and helps guide treatment, as well as the response to treatment in some cases. Renal biopsy is typically performed by a radiologist under CT or ultrasonographic guidance. However, a urologist can also perform renal biopsy during renal surgery. Paripovic et al  and Printza et al  both performed retrospective studies to determine indications of pediatric renal biopsy. Both found that nephrotic syndrome was the most common indication (32.9%). Paripovic et al found that other indications included asymptomatic hematuria (23.4%), urinary abnormalities in systemic diseases (15.8%), and proteinuria (11.4%). Both studies found that glomerular disease was most prevalent. Paripovic et al found that the most common causes of glomerular disease included focal segmental glomerulosclerosis (20.9%), mesangioproliferative glomerulonephritis (14.6%), immunoglobulin A (IgA) nephropathy (8.9%), minimal change disease (13%), lupus nephritis (6%), and Henoch-Schönlein nephritis (4%). Printza et al found that the most common findings included focal segmental glomerulosclerosis (15%), IgA nephropathy (13.5%), minimal change disease (10%), various stages of lupus nephritis (8.5%), Henoch-Schönlein nephritis (7.5%), membranous glomerulonephritis (7.5%), mesangioproliferative glomerulonephritis (6%), postinfectious glomerulonephritis (6%), hemolytic uremic syndrome (5%), tubulointerstitial nephropathies (3.5%), and acute tubular necrosis (2.5%). 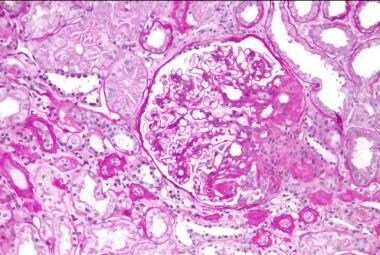 The image below depicts a micrograph of focal segmental glomerulosclerosis. Rush et al from the Manitoba Adult Renal Transplant Program were the first to report the finding of subclinical rejection within the first 3 months post transplantation. Subclinical rejection can be broadly defined as lymphocytic infiltration of a renal allograft with normal function. Rush et al further classified subclinical rejection as a serum creatinine increased by more than 10% 2 weeks before the protocol biopsy and a histological Baniff score (system used for scoring renal allograft histology) of “ai2at2” (type 1A acute rejection) or greater. The controversy regarding this topic is whether detecting subclinical rejection from a specific biopsy protocol can guide early successful treatment of renal allograft pathology, ultimately improving long-term graft function. A study analyzed a 10-year follow-up of their patient population diagnosed with subclinical rejection at 14 days post transplantation. Their results showed a significant decrease in graft survival over the 10-year period, concluding that subclinical rejection can predict transplant outcomes. Another study attempted to determine the benefit of early detection of subclinical rejection and subsequent treatment with corticosteroids. The study featured 72 patients randomized to 2 biopsy groups, one receiving biopsies at 1, 2, 3, 6, and 12 months (biopsy arm) and the other receiving biopsy at 6 and 12 months (control group). Patients in the biopsy group showed a decrease in acute rejection, reduced chronic tubulointerstitial score at 6 months, and a lower serum creatinine at 24 months compared with patients in the control group. On the other hand, when renal transplant dysfunction is suspected as evidenced by rise in serum creatinine level, or clinical signs, such as fever, edema, hypertension, oliguria, and proteinuria, the allograft biopsy is mandatory for adequate histological diagnosis . Some studies went on analyzing the accuracy of clinical prediction of allograft pathology related to diagnosis found after renal biopsy. Findings revealed 43% of clinical predictions were totally correct and of the 57 % of cases where predictions were not accurate, 26% of those cases were completely incorrect, clarifying the necessity of renal biopsy for accurate diagnosis of allograft pathology. Renal allograft biopsy is very useful in identifying acute rejection in the transplant allograft and guide the treatment of antibody-mediated rejection or acute cellular rejection. Once the correct treatments are initiated, a repeat biopsy helps confirm adequate response to treatment. Other considerations include the possibility of infection, injection into a muscle (creating a hematoma), and the possibility of the biopsy needle inadvertently piercing other organs in close proximity to the kidney, such as the colon, spleen, and liver. Paripovic D, Kostic M, Kruscic D, et al. Indications and results of renal biopsy in children: a 10-year review from a single center in Serbia. J Nephrol. 2012 Feb 27. [Medline]. Printza N, Bosdou J, Pantzaki A, et al. Percutaneous ultrasound-guided renal biopsy in children: a single centre experience. Hippokratia. 2011 Jul. 15(3):258-61. [Medline]. [Full Text]. Mehta R, Cherikh W, Sood P, Hariharan S. Kidney Allograft Surveillance Biopsy Practices Across US Transplant Centers: A UNOS Survey. Clinical Transplantation. 2017 Mar. 2:[Medline]. Rush DN, Henry SF, Jeffery JR, Schroeder TJ, Gough J. Histological findings in early routine biopsies of stable renal allograft recipients. Transplantation. 1994 Jan. 57(2):208-11. [Medline]. Rush D. Protocol transplant biopsies: an underutilized tool in kidney transplantation. Clin J Am Soc Nephrol. 2006 Jan. 1(1):138-43. [Medline]. Choi BS, Shin MJ, Shin SJ, et al. Clinical significance of an early protocol biopsy in living-donor renal transplantation: ten-year experience at a single center. Am J Transplant. 2005 Jun. 5(6):1354-60. [Medline]. Rush D, Nickerson P, Gough J, et al. Beneficial effects of treatment of early subclinical rejection: a randomized study. J Am Soc Nephrol. 1998 Nov. 9(11):2129-34. [Medline]. Ahmad I. Biopsy of the transplanted kidney. Semin Intervent Radiol. 2004 Dec. 21(4):275-81. [Medline]. [Full Text]. Al-Awwa IA, Hariharan S, First MR. Importance of allograft biopsy in renal transplant recipients: correlation between clinical and histological diagnosis. Am J Kidney Dis. 1998 Jun. 31(6 Suppl 1):S15-8. [Medline]. Dörje C, Mjøen G, Strøm EH, Holdaas H, Jenssen T, Øyen O, et al. One-year protocol biopsies from ABO-incompatible renal allografts compared with a matched cohort of ABO-compatible allografts. Clinical Transplantation. 2015 Mar. 29(3):268-76. [Medline]. Renal Biopsy. Medline Plus. Available at http://www.nlm.nih.gov/medlineplus/ency/article/003907.htm. Accessed: June 18, 2012. Rose, MD, Burton, and Theodore Post MD. Chapter 2B: Renin-angiotensin system." UpToDate. (2004). 1 Mar 2012. McCune TR, Stone WJ, Breyer JA. Page kidney: case report and review of the literature. Am J Kidney Dis. 1991 Nov. 18(5):593-9. [Medline]. Harrison, K L. Renal dysfunction due to an arteriovenous fistula in a transplant recipient. Journal of the American Society of Nephrology 5.6 Dec 1994. Williams & Wilkins; 01 Mar 2012. 1300-6. Korbet SM. Percutaneous renal biopsy. Semin Nephrol. 2002. 22:254–267. [Medline]. Kitterer D, Gürzing K, Segerer S, Alscher MD, Amann K, Braun N, et al. Diagnostic impact of percutaneous renal biopsy. Clin Nephrol. 2015 Dec. 84 (12):311-22. [Medline]. Kriegshauser JS, Patel MD, Young SW, Chen F, Eversman WG, Chang YH, et al. Factors Contributing to the Success of Ultrasound-Guided Native Renal Biopsy. J Ultrasound Med. 2016 Feb. 35 (2):381-7. [Medline]. Hogan JJ, Mocanu M, Berns JS. The Native Kidney Biopsy: Update and Evidence for Best Practice. Clin J Am Soc Nephrol. 2016 Feb 5. 11 (2):354-62. [Medline]. Shetye KR, Kavoussi LR, Ramakumar S, Fugita OE, Jarrett TW. Laparoscopic renal biopsy: a 9-year experience. BJU Int. 2003 Jun. 91 (9):817-20. [Medline]. Loupy A, Haas M, Solez K, et al. The Banff 2015 Kidney Meeting Report: Current Challenges in Rejection Classification and Prospects for Adopting Molecular Pathology. Am J Transplant. 2017 Jan. 17 (1):28-41. [Medline]. Disclosure: Serve(d) as a speaker or a member of a speakers bureau for: Endo, Avadel.